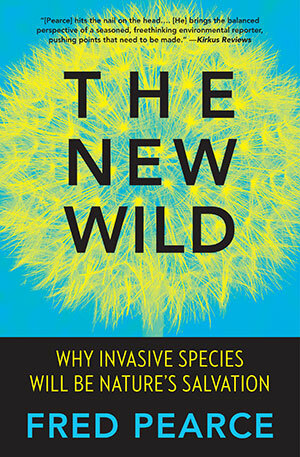 From the Introduction: "Nature in a World of Humans"
Rogue rats, predatory jellyfish, suffocating super-weeds, wild boar, snakehead fish wriggling across the land—alien species are taking over. Nature’s vagabonds, ruffians, and carpetbaggers are headed for an ecosystem near you. These biological adventurers are traveling the world in ever greater numbers, hitchhiking in our luggage, hidden in cargo holds, stuck to the bottom of ships, and migrating to keep up with climate change. Today’s human-dominated world of globalized trade and messed-up ecosystems is giving footloose species many more chances to cruise the planet and set up home in distant lands. Some run riot, massacring local species, trashing their new habitats, and spreading diseases. Most of us like a simple story with good guys and bad guys, and aliens always make easy enemies. So the threat of foreign species invading fragile environments and causing ecological mayhem gets our attention. Conservationists have for half a century been battling to hold back the tide of aliens. They call them the second biggest threat to nature, after habitat loss. Their concern is laudable. They want to protect native species and the ecosystems they inhabit. But do we fear these ecological outsiders too much? Most environmentalists would recoil to think this, but maybe our fear is sometimes little more than green xenophobia. Most of us are appalled when foreign humans are treated as somehow intrinsically dangerous. Yet the orthodoxy in conservation is to demonize foreign species in just that way. Native is good and alien is bad. But is this simple formula true? Or might we need the go-getter, can-do aliens? Might their success be a sign of nature’s resilience in the face of the considerable damage humans have done to the planet? I am an environmental journalist. Even to ask such questions gets me treated in some circles as a conservation heretic. I have met incredulity and hostility in equal measure. To be clear, I am not accusing environmentalists of being closet xenophobes or misanthropes, still less racists. But I have also found that I am far from alone in my concern that we have bought into some dangerous mythology about how nature works. I am not questioning the motives—to strengthen nature—but the means. Many ecologists who actually study nature have told me that they feel conservationists are, with the best of intentions, getting the aliens wrong. And worse, that their efforts to keep out all foreign invaders of ecosystems might often be counterproductive, weakening nature rather than strengthening it. I have discovered that there is a scientific backlash against the simple formula that natives are good and aliens bad. The purpose of this book is to explore that new thinking and to ask what it should mean for conservation. My conclusion is that mainstream conservationists are right that we need a rewilding of the Earth, but they are wrong if they imagine that we can achieve that by going backward. We need a new wild—hence the title of this book. But the new wild will be very different from the old wild. We have changed our planet too much, and nature never goes backward. Nature’s resilience is increasingly expressed in the strength and colonizing abilities of alien species. They are often the new natives. And in the new wild, we need to stand back and applaud. There are horror stories about alien takeovers, of course. Most of those stories are set on small remote islands with only a few native species, where carnivorous rats, cats, and others hop off ships and cause mayhem. But elsewhere, most of the time, the tens of thousands of introduced species usually either swiftly die out or settle down and become model eco-citizens, pollinating crops, spreading seeds, controlling predators, and providing food and habitat for native species. They rarely eliminate natives. Rather than reducing biodiversity, the novel new worlds that result are usually richer in species than what went before. Even the “terrorists” of the conservation world, such as zebra mussels and tamarisk, Japanese knotweed and water hyacinth, often have a good side we rarely hear about. After going on the trail of alien species across six continents, my conclusion is that their demonization says more about us and our fears of change than about them and their behavior. Some ardent wildlife lovers show a dark side when it comes to aliens. I sometimes think the more ardent they are, the more likely they are to be rabid about alien species. Understandable love of the local, the native, and the familiar—of an imagined pristine environment before humans showed up—too often becomes fear and hatred of the foreign and the unfamiliar. This hostility is generally justified by outdated and ill-founded ideas about how nature works. We often think of life on Earth as made up of complex and tightly knit ecosystems like rainforests, wetlands, and coral reefs that are perfected and stable, with every species evolved to have a unique role. With that vision of nature, alien species are at best disruptive and at worst plain bad. But where did this idea come from? Darwin certainly never expressed it. He wrote that natural selection allowed species to adapt and survive, but he said nothing about ecosystems evolving to some sort of perfect state. They were just a jumble of species making their way in the world. Today, fewer and fewer ecologists believe nature is either stable or perfectible. Real nature, they say, is often random, temporary, and constantly being remade by fire, flood, and disease—with species coming and going, fitting in, adapting, or losing out. Change is the norm, they say. In this vision of nature, alien species are just like any others. Whether brought by humans or in more traditional ways, they are not an intrinsic threat to ecosystems. They are part of nature doing its thing, constantly reordering itself, constantly submitting to random events. Aliens may or may not cause change, but if change is the norm, then there is no harm in that. In any case, when invaded by foreign species, ecosystems don’t collapse. Often they prosper better than before. The success of aliens becomes a sign of nature’s dynamism, not its enfeeblement. This new ecological thinking is critical for how we understand the meaning of conservation and for what actions we take in the name of protecting nature. If nature is perfected and vulnerable to outsiders, then conservationists have to line the barricades to keep out the interlopers and restore the balance of nature. That’s what most conservationists think, and for a long time I shared that view. But if it is wrong, then keeping out aliens serves no obvious purpose. More than that, it may be counterproductive. Nature’s desperados are proven colonists and exploiters of the ecological mess that humans leave behind them. So surely that makes them nature’s best chance of healing the damage done by chain saws and plows, by pollution and climate change. Far from being nature’s destroyers, aliens may be its reinvigorators, its salvation. They may be a sign that nature is not done. That it can bounce back. If that thinking is right, then simple conservation is shortsighted, and true environmentalists should be applauding the invaders. I do not want to suggest that we should always welcome every alien species. We humans may sometimes want to protect the species we know and love—in the habitats that we are familiar with. There is nothing wrong with that. And where alien species cause us inconvenience—whether zebra mussels in American waterways, rats on oceanic islands, or rabbits in Australia— we may want to try to halt their spread. Again, that is fair enough. We have a legitimate need to curb some of those excesses and a legitimate desire to protect what we like best. But we should be clear that when we do this, it is for ourselves and not for nature, whose needs are usually rather different. While we seek to protect what we like in nature, we should remember something else. There is very little that is truly natural in nature anymore. There are very few, if any, pristine ecosystems to be preserved. Thanks to the activities of humans over thousands of years, no forests are virgin. They are all regenerating from past human invasions. We live in a new geological era, the Anthropocene, in which nothing is undisturbed and most ecosystems are a hodgepodge of native and alien species, often getting on in unexpected and productive ways. Over my years as a journalist, I have written plenty of articles about how much harm alien species appear to do—about killer algae, marauding water hyacinth, and many more. There was truth in them all, but they missed the bigger picture. This book is my journey to discover what conservation should really be about in the twenty-first century. It should not be about trying to preserve nature in aspic, still less about trying to recreate the past. That is both impossible and an affront to nature, like trying to turn the world into a giant zoo. In the twenty-first century, rather than fighting a losing battle to protect what we imagine to be pristine nature, we should be encouraging nature’s rebirth, often through the dynamism and invasive instincts of its alien species. Nature does not exist to do our bidding. While alien species may sometimes be a pain in the neck for human society, they are often exactly the shot in the arm that real nature needs. Conservationists who want to cosset nature like a delicate flower, to protect it from the threat of alien species, are the ethnic cleansers of nature, neutralizing the forces that they should be promoting. It is foolish to fear nature at its most dynamic—red in tooth and claw, rhizome and spore, root and branch. As true environmentalists, we should rejoice when species burst through the paving stones of our cities or wash up on foreign shores. We should celebrate nature’s powers of recovery. We should let it run wild. How else are species to thrive and respond to the disruption of our activities, including climate change, if not by invading new territories, by becoming aliens? True nature lovers should see that. Harvard biologist Edward O. Wilson, the guru of biodiversity and rainforests, said that the twenty-first century will be “the era of restoration in ecology.” I hope so. But we will not be going back to a supposedly pristine world. We cannot. We should be restoring nature’s wildness, not trying to turn one moment in its past into an ossified museum relic. The new wild will be different but no less dramatic and wonderful than the old wild. Alien species, and the novel ecosystems they inhabit, will be at the heart of it. We should bring them on.